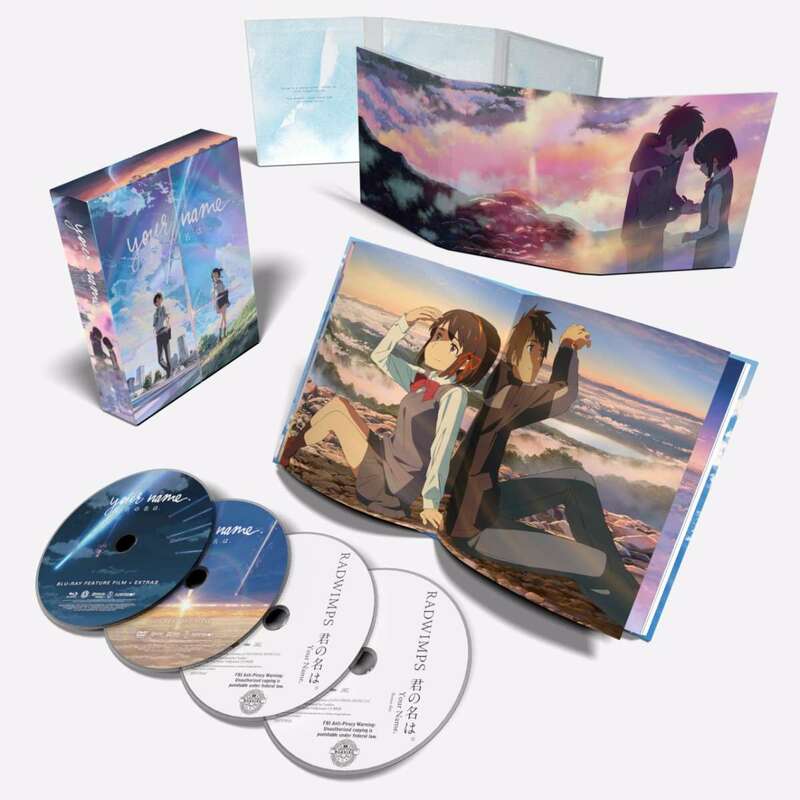 Your Name Limited Edition contains two-piece double-sided collectible chipboard box with rainbow holographic finish; 2-disc original soundtrack by RADWIMPS, with English and Japanese versions; 60-page hardcover art book, and Art digipack. In Your Name, Mitsuha and Taki are complete strangers living separate lives until they suddenly switch places. Mitsuha wakes up in Taki’s body, and he in hers. This occurrence happens randomly, and they must adjust their lives around each other. Yet, somehow, it works. They build a connection by leaving notes for one another until they wish to finally meet. But something stronger than distance may keep them apart. Special Features: your name. : Interview with Makoto Shinkai, Makoto Shinkai Filmography, Special TV Program, Trailers. T_T It's so good to be alive to be able to purchase this. Your Name is a masterpiece! The hype truly was real for this movie and despite waiting since August of last year for it to come out, I can say that the wait was way more than worth it, and I’m not just saying that. “Your Name.” Is an unmitigated visual and storytelling masterpiece unlike any released in this decade, or in the past one. It truly shines above some of the greatest works in the anime forefront and also as one of the greatest movies ever made, period! I rarely use the word perfect to describe a film, but the truth is, while I like to believe that no movie is without its flaws, I always believed that a flawless movie was difficult, but not impossible. 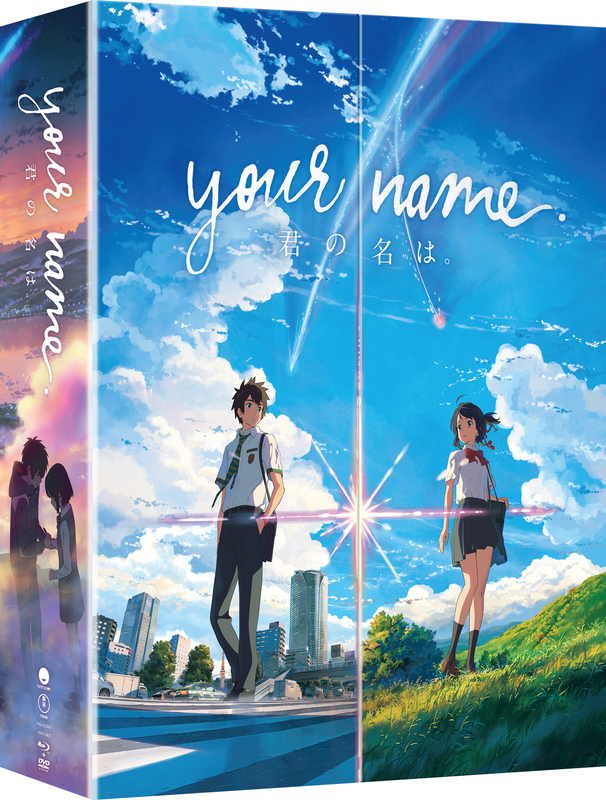 “Your Name.” Rests on the same pedestal as other masterpieces animated or not like Spirited Away, The Godfather and The Shawshank Redemption. Believe the hype, go see it where available, you do not wanna miss this movie. Overall Rating: 10 out of 10= Masterpiece! Watched it at cinema (in Sweden!) and loved it just as much as the girl who leapt through time. Bought the manga when I spotted that it was also available (although waiting on volume 2 before reading it), which I would recommend if you have any plans to buy a limited edition of the anime. I would probably watch the movie first, as if you read a manga you might imagine different voices. Not sure I should spoil anything at all from the movie, so I'll just categorize it as one of those tearjerking romance shows you can run across. It is well animated and beautiful, when you see something past the tears. The bonuses for this limited edition seem pretty nice, although as it is in pre-order state I have of course no experience with them physically. Bar none, one of the greatest films I've ever seen. Story revolves around 2 teens who trade bodies. It sounds cliche as to be contrived. Boiling it down to such an easy description the problem. Without giving away plotl, and to ensure the film has the impact on you that it should, you should avoid spoilers and jump in. The animation is incredible. Highly detailed & fluid. The voice acting (only watched Japanese) is full of emotion (coming from someone who can speak/understand Japanese). English language version should be as good. There are hints that can give it all away, but you won’t likely catch them on first viewing. Even after knowing the twists, it’s still amazing to watch. Why go with the LE over regular? Only if you want the soundtracks. My Japanese LE came with the UHD, didn't have the soundtracks. Iit turns out buying this LE is close to par with just spending a $$$ more over import. I like to support "local" suppliers as well. I haven't obsessed over a movie like this for decades... it is beautiful in story, artwork, and imagery. My daughter saw this in its limited run in theatres up here in Canada and bought the movie from Japan with English subtitles when it was first released there. We had to rig our DVD player so we could watch it. The first scene had us questioning why she liked it, but it seemed decently interesting, although we thought it was likely going to be predictable. Then WHAM! It hits you with a doozy and then then another and then you realize how much you missed in the first part. This is a movie that is difficult to properly review without spoilers. So all I will say is that it is a relationship story that gets off to a very rocky start. If you like anime such as "Stein's Gate" or "Summer Wars", you will be completely satisfied with this film. So the movie itself is amazing. Many people already know that getting this. The limited edition box set itself is good to look at, and has a small art book. The extra are alright. Is a box set made for people who are huge fan, but that being said most people are better off just buying the blu ray if I am being honest. Or if you can get it under 50$ buck like I did than I I guess you won't feel like you wasted your money that much. I just got finished watching this movie. I let the box sit for a long while after receiving it, and I'm mad at myself for not watching it ASAP. At face value, this looks like a simple teen romance story with wacky body-swapping hijinks. And you do get that, don't get me wrong. But at about the halfway point, the story kicks in, and elevates the film into something much greater. I thought I knew exactly where this film was going for a while, and I ended the experience feeling 100% satisfied. My expectations were wrong, but in the best way possible. If this were just a simple body-swap story, it still would've been good. But because the movie still included a thrilling and worthwhile story, it's just that much better. Match that with breathtaking animation, a fantastic English dub (with REALLY GOOD child actors for the young characters), and fully English translated music, and you're in for a magical experience. Oh yeah, and the limited edition box & other extras are gorgeous, too. If you get no others, get this one. This is one great movie. Music, story, Japanese voice acting, all first rate. I see why people enjoyed this anime movie , it has great animation with a great story , its one of my favorite movies that the creator has done. as for the boxset, the boxset is nice and I see what FUNimation was trying to do but its annoying to take it off the shelf and it slides off , I prefer the old boxsets way. My wife and I saw this twice in theaters, once with a fellow anime fan and once with someone relatively new to anime. Both times it was subtitled, and both times all of us loved it. As soon as it was available for pre-order, we snatched it up. This version is great. From the soundtracks (Both the English and Japanese versions) to the artbook, it's a great set. For the movie itself, we recently rewatched it in English and loved it just as much as the Japanese version. Funimation has become great for English dubs, and this film was no exception. Highly recommended! Pre ordered this before I had even seen the movie. Best choice I could of made. It's now my go to anime to show guest of friends and show them the amazing art work peices. Definitely a good purchase for anyone who loves soulful anime. Kept hearing about the movie and figured why not give it a shot. Glad that I gave into pressure because this movie was definitely worth it. Granted the real push was how the limited edition was actually limited. I admit, I bought and watched this with little to no expectations. I knew nothing about it other than the tid bit from RSA, and the reviews. What I got was a first rate experience. Basically, it's about a teenage boy and a teenage girl that for a period of time, swap bodies every couple of days. Admittedly, the first parts of this are funny, but then the whole thing takes a serious turn and it becomes something else, and best enjoyed as the experience this movie is. I'm more than happy to have this in my collection. On a side note, the limited edition is fantastically packaged. If you're into nice packaging, this is the edition for you! Otherwise the standard edition will do you just fine I imagine. I love the design of this product. If you watched Funimation's "Hey! Nice Package" video, then you'll understand how much thought they put into it. The box is shimmery and allows you to literally pull Mitsuha and Taki apart and bring them together. The box has the Blu-Ray, DVD, and the soundtrack in one case. For the soundtrack, it comes with all the tracks in English and Japanese on the other disc. In the book, you will find a collection of key images from the film and character designs. As far as extras go, there aren't a lot aside from the TV interview and panel. They are still worth checking out. I can't recommend the film enough. It's better to watch it on Blu-Ray to see all the careful lighting choices and effects. The story is something that hasn't been done like this so everyone should watch it. The movie alone is worth getting defiantly a Shinkai masterpiece. This limited edition takes it to a new level. The team that designed this really did a fantastic job from the box down to the digipak that houses the discs. I really love how it includes the soundtrack on CD which is a rarity to find now in days for most titles. This release also comes with a wonderful artbook. Overall defiantly worth every penny if you decide to pick this release up! I've managed to take my daughter to see this anime movie (Limited Showing) at a theatre & we both enjoyed very much. So I decided to pre-order this Limited Edition for my private collection & I was glad to have it before it is "Out-Of-Print." Recently, at a local Anime Convention they manage to show Your Name as part of the Anime Viewing Series & I've watching it again. Great anime movie, Two Thumbs Up!